Step-by-step instructions on how to create an EmbedClip in WS.WebTV. • Previous understanding on how to create Clips. 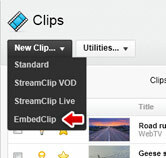 • Your WebTV must have the EmbedClip extension. 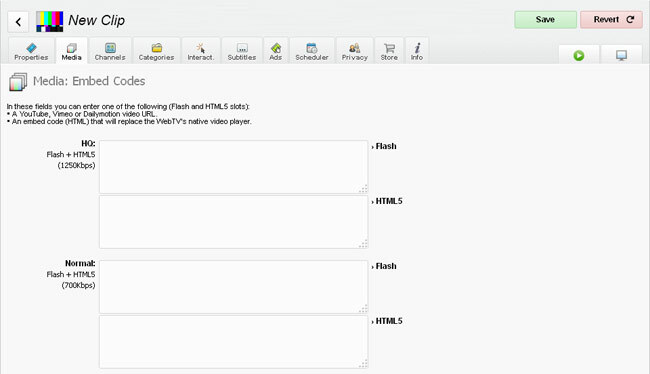 • Version used for the screen captures: WS.WebTV Professional 1.7.5 (all extensions enabled). Some options/features might be different, respect your WebTV, depending on the installed version and extensions you have purchased. An EmbedClip is a special type of Clip that, instead of linking to video files, it stores an embed code; however, when a YouTube video URL is supplied (instead of an embed code) WS.WebTV will playback the video directly. A note regarding Interactivitites: According to the Google/YouTube terms and conditions, you must not overlay elements in front of the YouTube video player; in this regard, you shall not use Interactivities with YouTube direct playback EmbedClips. By this time, you should be familiar on how to create and edit a Clip. If this is not the case, please check the "Clips: Create/Edit" tutorial before continue reading. In the next steps we will focus on the main characteristic of this kind of Clip: the Media Tab. Click on "New Clip..." button and select "EmbedClip". From this tab you will be able to enter the YouTube URLs. As usual, there is a set of slots per each WebTV Quality and, depending on the "Target" of each Quality, you will see one or two slots (for Flash and/or HTML5). Note: the value "3S8a180uYBM" corresponds to the video ID; each YouTube video has a unique (different) ID. If you enter a YouTube URL without any prefix, the WebTV will use the YouTube Global Quality Mapping (Configuration > Video / YouTube) in order to playback the corresponding video quality. When you want to specify the quality, overriding the global mapping, then you can do so by adding the [youtube:quality] prefix to the YouTube video URL. Posible values for the "quality" parameter are: small, medium, large, hd720, hd1080, highres. Please, note that the YouTube video must support the specified quality, otherwise the default quality will be played back. - Interactivities / PlayerLogo: These features will only work when using direct YouTube Playback; however, according to the Google/YouTube terms and conditions, you must not overlay elements in front of the YouTube video player; therefore you shall not use Interactivities/PlayerLogo with YouTube direct playback EmbedClips. - Playlists: When using EmbedClips into a Channel's playlist, it will interrupt the continuous playback of the playlist where they are included; this is because of the video player replacement, however, skip back/forward buttons will appear in order to continue with the Channel's playlist playback. - The use of embed codes from third party Websites is subject to the terms and conditions of those Webites. Additionally, it is possible that you won't be able to embed/import videos configured as private/restricted/protected on the third party Websites (YouTube, Vimeo, etc.). - "Direct YouTube playback" is only supported on HTML5 through the YouTube Iframe API. Note regarding playlists on HTML5: On desktop PCs, YouTube videos will play continuously; however, on mobile devices a user interaction is required in order to continue the playback. This is a limitation imposed by mobile browsers not by WS.WebTV. "Direct YouTube playback" functionality is subject to the terms (and will...) of YouTube. WebTV Solutions is not related in any way with YouTube and does not guarantee this functionality.